As we had earlier informed you about the launch of the Xolo Q600 in the Indian market. Now we had brought the detailed review of the device. The Smartphone’s market is already filled with numerous options in every range. And this new device from Xolo will again compete in the budget segment with many other devices that are buzzing in the market. Xolo Q600 comes with the newer features that it packs the Quad Core processor, Dual camera options and dual SIM standby and a larger 4.5 inch display. So the specifications seems to be pretty decent as nowadays a larger screen is a must have feature in any device. Also the device comes with very competitive price tag, so that customers will not have to spend more for it. Now we will see the Quick review, features and specifications that this phone is offering. The Xolo Q600 features the dual camera options, and is expected nowadays from each device in every segment. It comes with the Primary 5.0 MP Auto focus camera with LED flash. The primary camera seems to be a decent one as most of the devices in this range packs the same camera. It has secondary VGA camera at the front side that lets the customers to enjoy the Video calling feature. Xolo Q600 has a decent camera options in this range. Also the clarity of the camera is good and an LED flash lets the user to capture the photos even in the low light. The Xolo Q600 comes with the 4GB of Internal memory that is expandable upto 32GB via Micro SD card. The internal memory seems to be a decent one and has the option of the Micro SD card so the users will never run short of the memory. The internal memory could have been on the higher side, but considering the price range in which the phone is offered to the customers the memory segment of the device looks good. Xolo Q600 is powered with Quad Core processor, which is the most hyped feature of the device. As it is coming with the greater processor the customers will be able to run the larger applications, play larger games and can perform various operations at the same time. It is powered with Quad Core MTK Cortex-A7 processor clocked at 1.2 GHz. The processor is further supported by the VR SGX544 GPU that will handle all the graphical processing of the device and will let the customers to enjoy the games and the movies on the device. It also extends the graphical quality of the device. The processor is again supported by the 512MB of RAM. And these seems to be on the lower side a higher RAM capacity was expected also at certain times can slow down the speed of the device. So the processor on this device seems to be a good one. Though the RAM capacity is not as expected. The device is packed with the 2000 mAh battery, that seems to be a good one, and can easily give a backup of about a day to the customer after a single charging. It will have exactly 13.4 hours of talk time on 2G, 10 hours of talk time on 3G and 333 hours standby time. And from this it is clear that the battery of the device is a decent one and will support the device nicely. 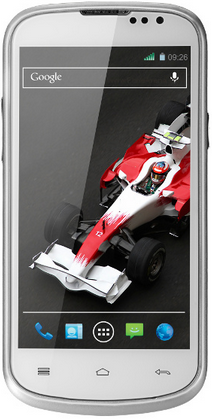 The Xolo Q600 sports a larger display, it has a 4.5 inch TFT FWVGA screen which seems to be a better one. The larger display increases the all around experience of the device, and is expected today from each new device which is being launched in the market. It has a screen resolution of about 480 x 854 pixels which is the same as in most of the other devices in this segment, it has the pixel density of 217 PPI which is above the mark. With the given screen resolution and the specified screen size this section of the device seems to be on the average mark and does not features any additional or newer feature. The Xolo Q600 packs most of the required features, for connectivity options it has the 3G, Wi-Fi, Bluetooth and GPS options. Also the device is a dual SIM phone so it lets the user to use both the SIM at the same time. Also for headphone connectivity it has the 3.5 mm jack. The phone runs on the latest Android v4.2 Jelly Bean operating system and that adds number of new features to the phone. All the other features are the same, and most of the must have features has been included in the device. When it comes to the comparison, the device seems to be competing with the devices that fall below the 10k range and has the Quad core processors. It will have a stiff competition from various phones that are present in the Indian market like the Micromax Canvas Lite A92, Karbonn A9+ , Lava Iris 458Q. Though with the competitive pricing and the good hardware specifications the Xolo Q600 seems to have an edge over the other devices in the segment. And various other International brands are also present in the budget segment in the specified price range. After analyzing all the specifications and the features of the Xolo Q600 we can state that it seems to be a decent device. It comes with the Quad Core processor, larger display size, dual camera options. Also the device is a Dual SIM enabled device, and has most of the connectivity options included. Also the previous releases from the Xolo Q700, Q800 and Q1000 in its Q series are performing well in the market. So it is expected that this device will also be a good performer in the budget segment. Xolo Q600 comes with the price tag of Rs. 8,999. Though the phone has the lesser RAM capacity and the screen resolution is also not so good. Though on the whole Q600 seems to be decent device and is ready to buzz the market in the budget segment.